Since summers are extremely hot, the best time to visit Jaipur is from October to March, when the weather is quite pleasant. Which are the top 5 must visit places in Jaipur? Amber Fort and Palace, Hawa Mahal, Nahagarh Fort, Jal Mahal and Jaigarh Fort are the top 5 popular places which you should not miss during your trip to Jaipur. How can I get attractive discounts on hotels in Jaipur? There are many online travel portals which provide a wide range of hotels along with great deals. Cleartrip is one such website which offers attractive discounts on hotel bookings. You can also use a valid coupon code to avail instant cashback before booking a hotel of your choice in Jaipur. Can unmarried couples stay in hotels in Jaipur? Yes, there are several hotels in Jaipur which allow unmarried couples to stay together but the accommodation will be provided only if suitable identification proof such as Aadhar card, Voter ID, etc. is presented at the time of check-in. How can I find hotels near Amber Fort and Palace, Jaipur? 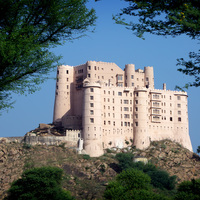 You can easily find hotels near Amber Fort and Palace on Cleartrip. 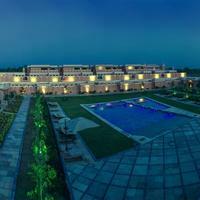 You just need to enter Amber Fort and Palace in theWhere field option on the Hotels Page. The lists of hotels near Amber Fort and Palace will be displayed in the search results and you can book the hotel according to your budget. 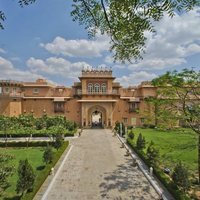 How do I book resorts in Jaipur? You can visit Cleartrip website Hotels Page and search for “resorts in Jaipur” in the Where location filter. 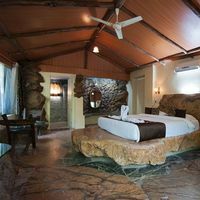 List of resorts in Jaipur will be displayed and you can choose from the listed ones as per your budget and requirement. Do Jaipur hotels offer Wi-Fi facility? 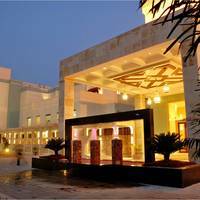 There are several hotels in Jaipur which offer Wi-Fi facility. Some of them are Hotel Mount View, Hotel Chinar, Hotel JMK International, Hotel Shree Palace and so on. For more options, click on hotels with Wi-Fi in Jaipur . However, it is always better to check with the hotel at the time of booking whether Wi-Fi is complimentary or not. What can I buy from Jaipur? You can buy jewellery and gem-stones, paintings, carpets, pottery, puppets and toys, spices, jodhpuri juttis, sweets, etc. Can you tell which are the best places to enjoy nightlife in Jaipur? Some of the best places to enjoy nightlife in Jaipur are 100% Rock, Palladio, Black Out, Replay, Club Nalia and Okra. Can you list the top 5 shopping areas in Jaipur? The best five shopping areas in Jaipur are Johari Bazaar, Tripolia Bazaar, Bapu Bazaar, Krishnapole Bazaar, and Nehru Bazaar. What are the famous sightseeing spots in Jaipur? There are a lot of tourist attractions in Jaipur, such as Hawa Mahal, Jantar Mantar, City Palace and Museum, Ishwar Lat, Central Museum, Dolls Museum, Birla Planetarium, Jal Mahal, Jaigarh Fort, Sisodia Rani Garden, Amer, Galta and many more. What are some must do things in Jaipur? Suggest a few places where can I enjoy best lunch buffets in Jaipur? Enjoy the best vegetarian and non-vegetarian lunch buffets in Jaipur with your loved ones at Hotel Vrisa. It is the best place to relish some lip-smacking delicacies as part of 4 course lunch meal. You can even head to Hotel Libra, which specializes in Continental, Chinese, South-Indian, Tandoori, and Indian delicacies. What activities and experiences can I enjoy in Jaipur? From sightseeing tours to adventure activities like cycling, jeep safari, elephant safari, the city has a lot to offer to everyone. 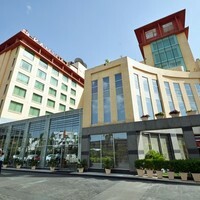 How to book a room for international guests near Apex Mall, Jaipur? Visit Cleartrip website and go to hotels in Jaipur option, and then select hotels near Apex Mall from the landmark dropdown. 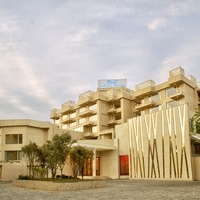 There are some great hotels near Apex Mall, and Ramada Jaipur is one of them. You can view a list of all the hotels near Apex Mall and choose the one best suited for international guests. From where can I book a good resort for a day outing in Jaipur? 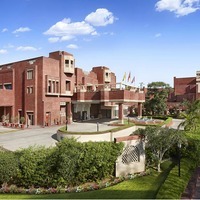 You can go for a day outing at a resort in Jaipur and experience the joy of having fun in the swimming pool, rain dance and various indoor and outdoor games. Cleartrip offers plenty of resort day outing options in Jaipur for you and your friends and family. 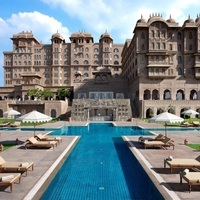 Can you name some 4-star hotels in Jaipur? 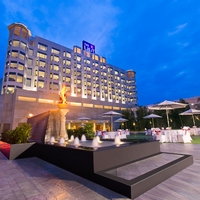 Some of the most popular 4-star hotels in Jaipur are Trident Jaipur, Umaid Bhawan A Heritage Home, and Umaid Mahal Heritage Castle. 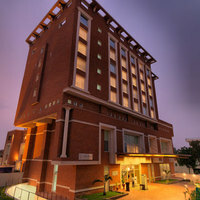 Book the best 4-star hotels in Jaipur at best prices through Cleartrip. 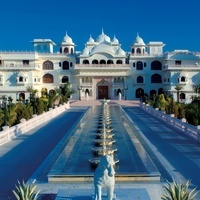 Can you list some hotels in North Jaipur? 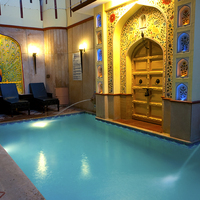 Shahpura House, Hotel Aashish, Hotel Rani Mahal, Hotel Ganga Kripa are few of the hotels in North Jaipur. For more information, you can choose North Jaipur from the ‘Hotels by Region’ drop-down on the Jaipur hotels page on Cleartrip. Can you name some budget hotels in Jaipur? If you are looking for some budget hotels in Jaipur then you can go for Hotel Sarang Palace, OYO 1006 Hotel Red Fort, etc. There are some budget hotels that offer the pay @ hotel facility too. 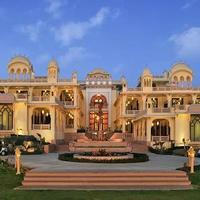 What are the top hotels to stay at Jaipur? 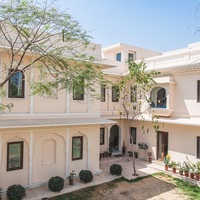 Looking for the top hotels in Jaipur ? 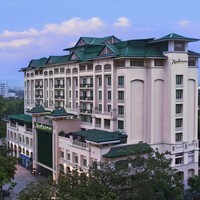 Then you can choose from ITC Rajputana, A Luxury Collection Hotel, Taj Jai Mahal Palace, and Jaipur Marriott Hotel. All of these hotels are equipped with a lot of amenities such as Air Conditioning, Business Centre, Restaurant, etc. How far is Jal Mahal from Chokhi Dhani? The total distance between Jal Mahal Jaipur and Chokhi Dhani is around 30 km. The driving distance between the two places is approximately 60 minutes. Where can I enjoy the best Rajasthani food in Jaipur? Enjoy the authentic Rajasthani food at Spice Court, Natraj, Handi, Shri Thaal Village Restaurant, Chokhi Dhani, Rawat Mishtan Bhandar, Niros, and Laxmi Misthan Bhandar. What are the top places of interest in Jaipur? Amber Fort and Palace, Hawa Mahal, Nahagarh Fort, Jal Mahal, Jaigarh Fort, City Palace, Sisodia Rani Garden, Albert Hall Museum, Galta Monkey Temple, Choki Dhani, Birla Mandir, Jantar Mantar Observatory, Rambagh Palace, Raj Mandir Cinema, Central Park and Bazaars of Jaipur are few top places of interest in Jaipur. Can you tell me about some heritage hotels in Lake Jal Mahal? 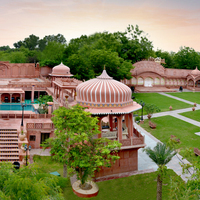 Raj Palace is one of the heritage hotels in Jaipur. 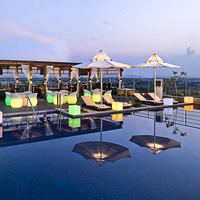 This majestic hotel can be booked online through Cleartrip app or website. Even though Jaipur does not have a vibrant nightlife as compared to other major cities of India, but it houses plenty of lounges, bars, hotels and other clubs which offer exciting and enjoyable night life to tourists. Can you list the hotels near Malviya Nagar, Jaipur? Treebo The Anchorage is the only option available in the locality. For booking online, visit Cleartrip website. Is room service available at Jaipur hotels? Almost all of the hotels in Jaipur offer room service to the guests. Four Boutique Hotel, Hotel Avana, Hotel Ethnic Residency, Hotel Metropolitan are few of the hotels in Jaipur offering room service. For more options, visit Cleartrip website and click on hotels with room service in Jaipur. Do hotels in Jaipur offer gym facility? Yes, there are many hotels in Jaipur which offer gym facility. 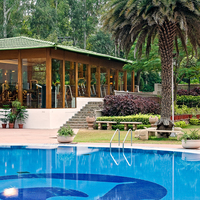 Trident Jaipur and Chokhi Dhani Resort are a few of the options. 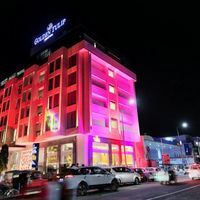 You can check out more hotels with gym on Cleartrip. Where can I go for weekend getaway from Jaipur? Ajmer, Sariska, Pushkar, Alwar, Ranthambore, and Bharatpur are some of the places to go over the weekend.